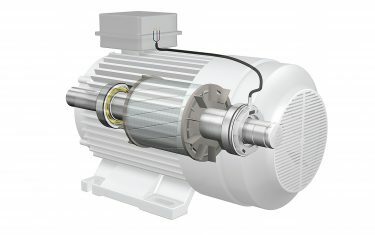 With AC motors now dominant in a wide range of industrial applications, there is increasing demand for more reliable methods of monitoring motor shaft speed, position and direction that is not only accurate, but also capable of withstanding the challenging mechanical, electrical and magnetic environments present in these machines. 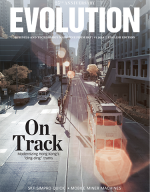 Integrated sensor bearings can now be designed to overcome these problems while also providing a more compact solution compared with shaft-mounted encoders. While traditional encoders have been used for many years to measure motor shaft speed, direction and position, they are essentially a ‘bolt-on’ extra that requires additional space on the motor shaft; moreover, these encoders are highly susceptible to mechanical shock loading, and their measurement outputs can be adversely affected by locally intense electric and magnetic fields. One solution has been to integrate the speed and direction sensor functionality with the motor shaft bearing assembly to create a ‘sensor bearing’ – an arrangement that solves the space problem at a stroke, providing a particularly compact alternative to traditional shaft-mounted encoders, and one that has fewer moving parts. However, sensor bearing technology employing Hall Effect devices to detect the speed, direction and position of the motor shaft are susceptible to interference from the strong magnetic fields generated by the motor currents, which can be many hundreds of Amperes in the case of larger industrial units. 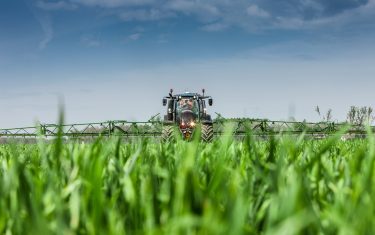 Susceptibility can be reduced or eliminated by use of effective shielding, electronic filtering or by using sensing techniques that are unaffected by the motor’s electrical and magnetic fields. 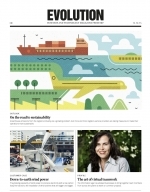 SKF introduced its first sensor bearing over twenty years ago and the latest design – designated BMD – is the fifth generation of SKF sensor bearings for AC motor control applications. The new BMD series has been developed to address two specific market requirements: to make the sensing arrangement more robust and better protected from the mechanical and electromagnetic extremes of the motor application, and to provide a lower cost solution for designers of highly automated mechatronic systems. The BMD series combines SKF Explorer deep groove ball bearings 6206 series (a popular choice for industrial vehicles such as forklift trucks) with a sensor assembly comprising impulse ring and a sensor body that includes the sensor elements, a protective Faraday cage and embedded electromagnetic filter. Fully interchangeable with previous sensor bearing designs, BMB and BMO, the BMD sensor body extends the bearings’ lateral dimension by just 6.2 mm – particularly useful for applications where space is limited. These sensor bearing units use Hall effect technology to produce an incremental encoder signal. An impulse ring, which attaches to the inner ring of the bearing, is a composite magnetised ring that contains a series of north and south poles, the number of poles depending upon the size of the bearing. 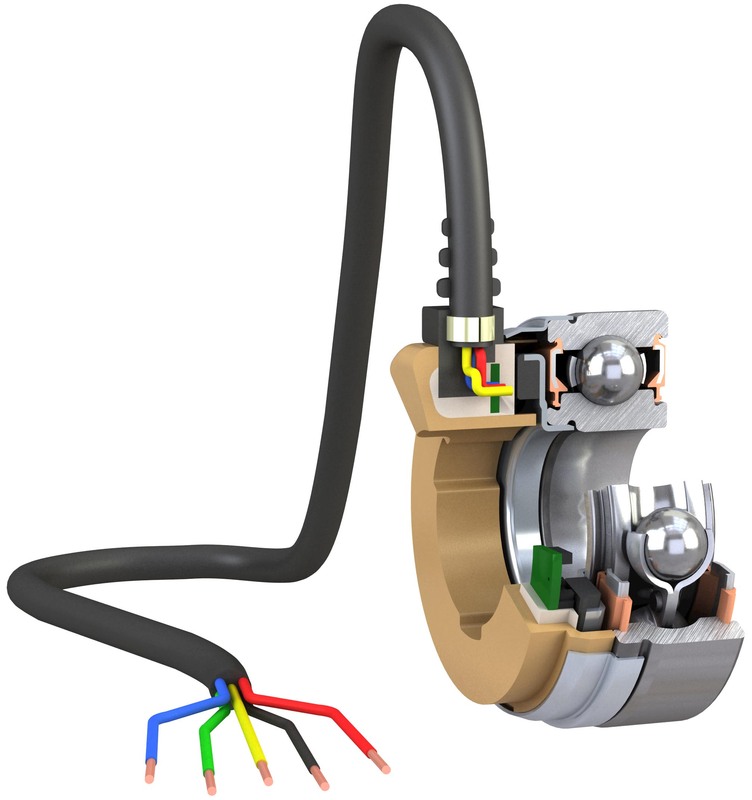 The sensor body, which is attached to the outer bearing ring, provides protection for the Hall effect cell and control electronics to provide an incremental encoder signal that is accurate from 14,000 down to zero revolutions per minute. The ability of these units to measure very low angular speeds is particularly notable, as this can be difficult using alternative measuring techniques. The Hall effect cell produces an output signal consisting of two square waves, which are phase separated by 90°. This phase shift changes sign with the direction of rotation, while the presence of two signals in quadrature enables a processing unit to multiply the number of angular position increments per revolution. For example, using a standard SKF sensor bearing with 64 pulses per revolution and a standard electronic interface that can detect the rising and falling times of each of the two signals, it is possible to obtain 256 electrical events per revolution, which translates to an angular resolution of 1.4°. Slow speeds can be obtained by measuring the time between two electrical events – events being the rising and falling edge on either square wave. High speeds are measured by counting the number of electrical events within a given time period. Another feature of the BMD, is its ability to work at ambient temperatures up to 150 ºC. Such thermal performance is important in environments commonly experienced in vehicle applications that produce thermal shocks, heavy vibration and extreme electromagnetic conditions. The design is also supported by new protective technology, one mechanical and one electronic, further improving the robustness of the system. A Faraday cage that is formed by the outside of the sensor body, provides an efficient physical shield against external magnetic fields, while the electronic shield is achieved through an integrated EMI filter that protects the sensor against power surges and electrostatic discharges. 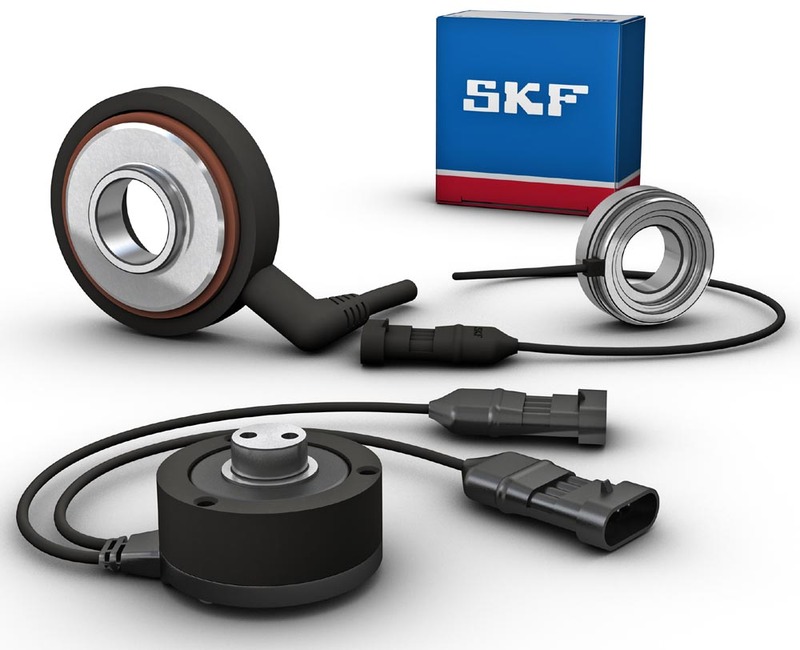 Another recent development from SKF is the BMH series encoder unit. Also combined with its SKF Explorer deep groove ball bearings 6206 series, the BMH system uses an inductive micro-coil technology that has been applied to sensor bearing applications for the first time. Here, two arrays incorporating inductive micro-coils sense electromagnetic (EM) pulses emanating from a moving metallic target wheel that rotates with the bearing inner ring. The micro-coils transform the EM signal into current, which is then converted into a voltage via a Schmitt Trigger that produces pulses directly related to the speed of rotation. The signal created is clearly detectable and separable from any background noise. One of the attributes of this sensing system is that it is valid for extremely low speeds and can provide accurate measurements over the range from zero to 20,000 rpm, and its ability to work at ambient temperatures up to 150 °C. Importantly, the technology is insensitive to external magnetic disturbances, thus avoiding the need for any magnetic shielding, which increases the overall system design flexibility. For example, units can be mounted inside the motor coils or magnetic brake, opening up new possibilities for weight and space saving design concepts that might incorporate encoding, power and control electronics plus electric brakes. One of the central design concepts for the BMH motor encoder unit has been its ‘plug-and-play’ functionality, which enables easy integration into new drive designs or when retrofitting to existing installations. Moreover, the fact that the unit is a true plug-and-play device means that development teams do not need to consider the particular requirements of the sensor in terms of environment, and will not have to engage in testing and qualifications for the sensor bearing system. For manufacturers, as well as being a system that is built with future developments in electric drives in mind, it offers less maintenance and repair during warranty periods. The BMH motor encoder unit is available as a standard off-the-shelf design or can be provided as a customised assembly complete with tailored cables and connectors. It provides two open collector outputs that can be incorporated into the overall drive control by suitable resistive loading. As industrial installations increasingly favour AC motors over traditional DC machines, SKF has seen an increased interest in its sensor bearing technologies and reports a healthy growth in sales of the BM series product ranges. These complete bearing sensing systems offer a variety of benefits, providing a more controllable, efficient and compact design in a standard format that is easy to fit into new and existing electric drive designs.